Please determined the price unit before setting the Price below. Number of car for rent: Enter the number Car on your system. Pricing ($): Enter the price for renting this car. Custom price: Select the price unit for building the package. select: Price by number of days/hour or Price by date. This is the example for Price by a number of day/hour. Title: Enter the name of the package. 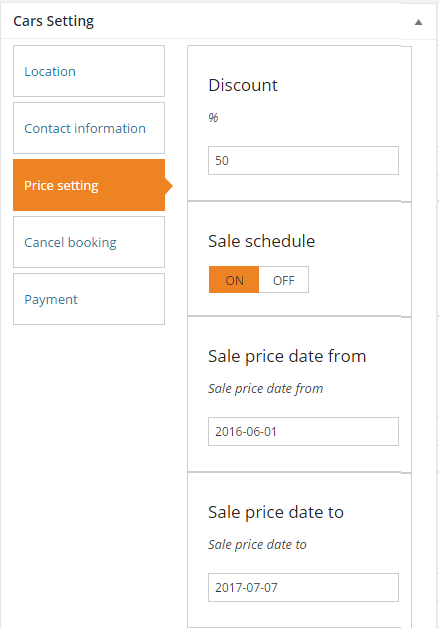 Sale Schedule: If you want to set schedule for sale on specific days ( such as sale off on holiday/festival) you should turn ON this option. Sale Start Date: enter the starting date of sale for present Car. Sale End Date: enter the ending date of sale for present Car. 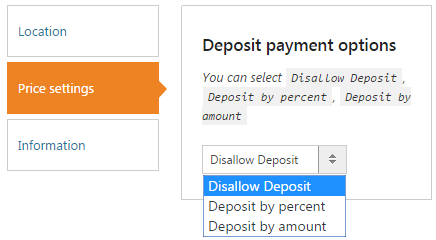 Deposit payment options: Choose payment methods for deposit: percentage of Car price, an amount of deposit, no deposit. Depending on the car, you should choose an appropriate one.